J@pan Inc talks to the Vice President of the Ireland Japan Chamber of Commerce. 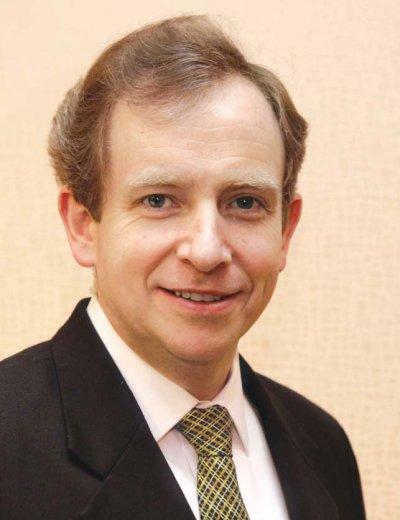 What is the nature of the Irish business community in Japan? The Irish corporate landscape is very much shaped by the global economy. A lot of multinational companies choose to have their European headquarters in Ireland, and as a result, many Irish-Japanese connections have occurred naturally in the course of economic globalization. Ireland has also proactively sought to cultivate Irish people with Japanese language and business skills. Since 1984, it has been sending graduates to work in Japanese companies, which is also how I first came here. Many of the people stay and they form a strong component of the community here. Others come on the JET programme and then there are a number of individuals drawn here for their own reasons. In which sectors are there significant Ireland-Japan activities? When the Irish government decided to get more involved in Japan, the appeal was in electronics, IT and technology where Japan is a leader, but people on the working program have experiences in a range of different businesses from automotive to finance. Then of course Guinness is getting more and more popular in Japan and smaller companies like Daon and Havoc are successful in the technology sector—Daon actually supply the technology for the new biometric security system at Narita airport. What synergies are there between Ireland and Japan? The majority of Japanese people don’t know much about Ireland but many Japanese companies see Ireland as a good place to base themselves in Europe—we are English speaking, costs are lower in Dublin than London and there is a good education system. In this sense, Ireland is a good gateway to Europe. Fujitsu has roughly 200 people based in Dublin and companies such as Hitachi, Mitsubishi, Olympus, Nikon, Astellas and KDDI also have a presence. For Ireland, Japan is a good export market and bilateral trade is up to Euro 4 billion. In fact, per capita, Ireland has the highest volume of exports to Japan in Europe. 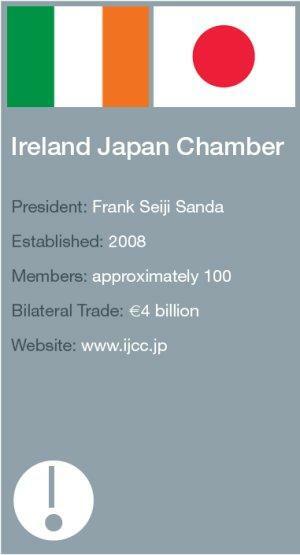 Can you tell us about the genesis of the Ireland Japan Chamber? The chamber is new, established in January 2008, and is a symbol of the maturity of the Irish business community. It grew out of the Japan Ireland Economic Association that has been going since 1973 and we have received some administrative support from the embassy. The Ambassador is our patron and we have warm relations with the embassy. We have about 100 members and are heading in a direction where we will have stronger financial foundations and will be able to take on permanent staff. Why did you decide to become a Chamber? Being registered as a Chamber of Commerce with the Japanese government gives us greater standing and visibility—we get greater access to information and can be more effective when lobbying the government. We also feel that as a chamber we will be able to attract more members and provide more for them. As well as lobbying we have regular events, networking, seminars and even the odd game of golf. What kinds of issues do you lobby on? Well most of our lobbying is done via the European Business Council but there are certain Ireland-specific issues. For example, we’re working hard on a social security agreement between Ireland and Japan. Once concluded the agreement will coordinate social security protection between Ireland and Japan which will eliminate dual social security taxation for employees who work in both countries. Can you tell us a bit about your experience in Japan?